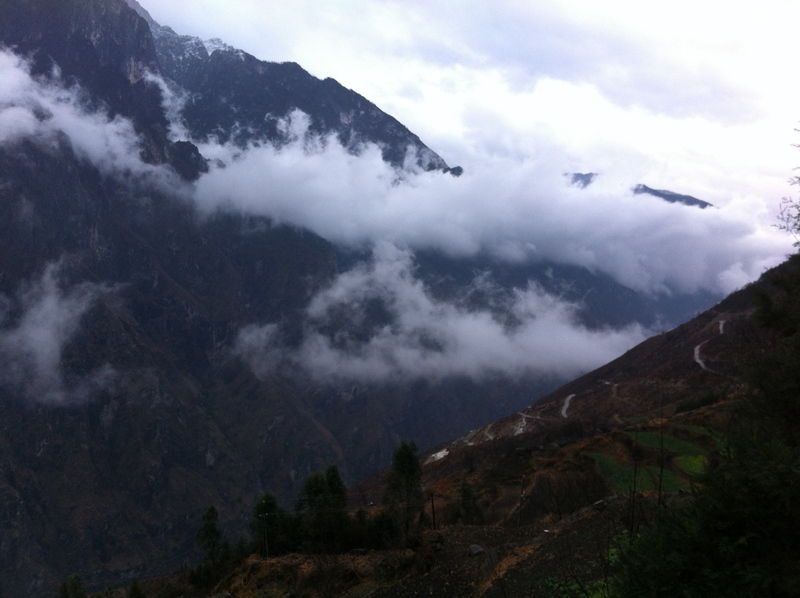 Alrighty, here is the second installment of my hike at Tiger Leaping Gorge. Colleen and I had decided the day before to take an extra day on the gorge. So, we slept in, ate some breakfast, and headed off towards our next destination, Halfway Guesthouse. We only had 2-3 hours of hiking for the day, so we took it nice and easy. On our way there we crossed paths with a Chinese family and a Chinese couple. 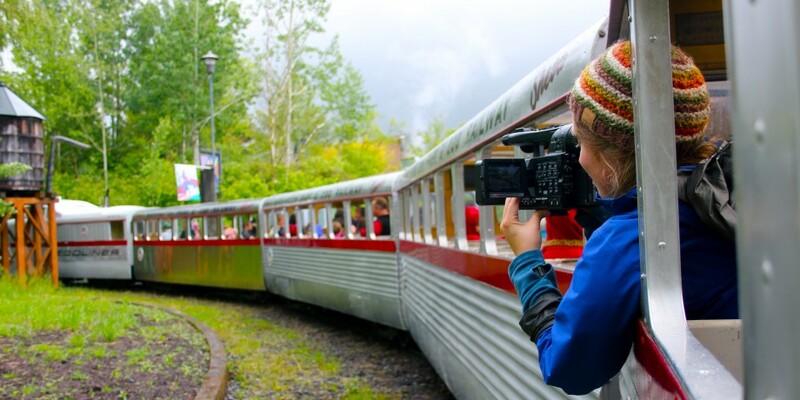 They were delighted to hear Colleen speak Mandarin, so they encouraged us to join them the rest of the way to Halfway. We thought, “why not, they’re friendly enough.” We continued on our way, taking pictures of the mountain and chit-chatting. I enjoyed talking with the little girl; she was a little sassy pants. We made it to Halfway with lots of daylight to spare. Colleen and I still had a bunch of energy so the father, the boyfriend, Colleen, and I explored the village a bit and found a trail leading down towards the river. We followed it for awhile, until it got too treacherous. It had rained that night, so there was a lot of mud. 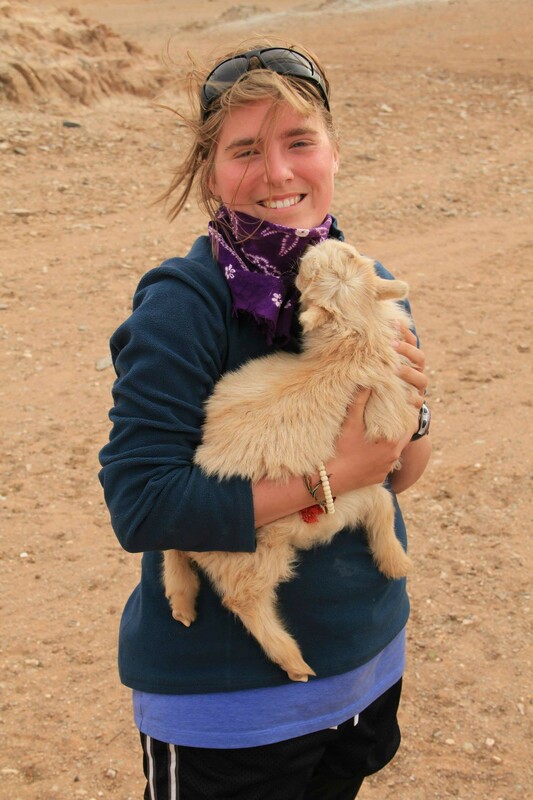 We still enjoyed our hike down and got to relax with a herd of goats. There were so many baby goats, I almost died from cute-ness. There were lots of fields we walked through. This was at the beginning of our hike from Halfway House. We hiked back up and relaxed. Colleen has been in quite the drawing mood, so the little girl (Cece) and her drew together. I decided to be a hermit and find a place to read. I had just started the second book of The Game of Thrones, A Clash of Kings, and wanted to know what would happen next. I also took some footage. I’m hoping to put some more up, but the internet connection is being a bit finicky. I forgot to mention how epic the toilet was at this guesthouse. There was a channel for your excretions, but then there was a just a cliff facing the mountains. There was a step, so someone wouldn’t fall off, but I had never taken a #2 with such a great view. Holy cow! We ate dinner with our new friends and drank baijiu, which is very very very strong vodka. The Chinese tend to love drinking even more then Americans (even college age kids. I’m not kidding). So, we joined in on some drinking games. It was very fun to learn some new games for when I come back to the U.S. Sometime throughout the night a friendly Korean, named Jason, joined in our festivities and decided to join us on our hike to Tina’s Guesthouse the next day (this is where we catch our bus). Overall, a very fun day. I woke up before everyone else and looked out the window to the mountains. Clouds had come in from the East and brought rain. Since we’re in a gorge, there is a lot of wind being funneled in the gorge itself, so the clouds below the mountain range were travelling very quickly. I watched a long while. I even came to realize that the clouds looked like dragons flying across the gorge. I made up stories in my head and found myself daydreaming until I heard Colleen wake up. It was a great way to start the day. We got up, ate some breakfast (wet rice with apples) and headed towards Tina’s Guesthouse with our new Chinese friends and Korean friend. It was a pretty chill hike. The only scary part was this waterfall we had to cross. It would’ve been easy enough, but it was raining and it was very windy. I lost my footing on a slick rock and almost feel near the cliff side (Mom and Dad, I survived! No worries.). Luckily there were bunches of other rocks that I could hold onto; I didn’t even fall into the water. Awesome me, right? We made it to Tina’s Guest House with 3 hours to spare before our bus to Sangrila departed. 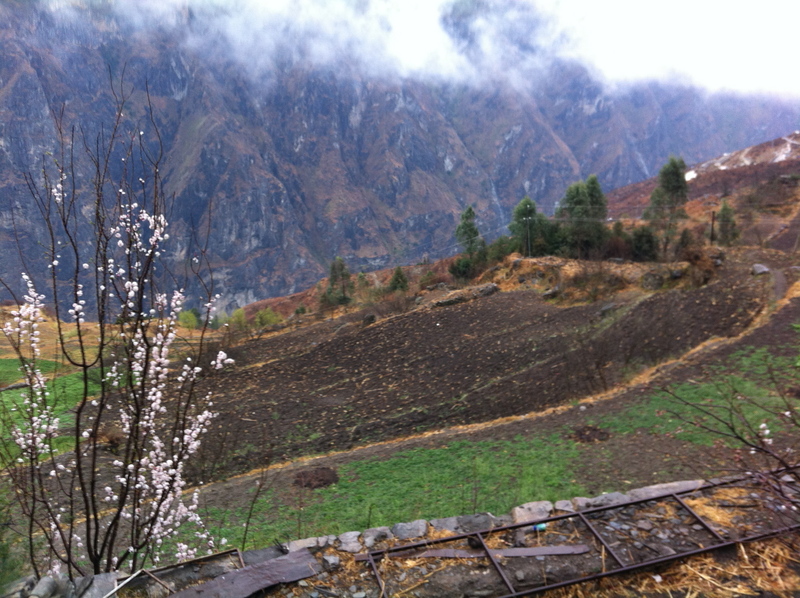 We at first spent 30 minutes catching our breath and eating some snacks, but then Colleen told me the famous part where the tiger leaped the gorge is down below the guesthouse. Colleen, Jason, and I decided to put our legs into gear and run down the cliff to the raging Jinsha river and find the famous boulder, where the Tiger leaped away from its hunters. 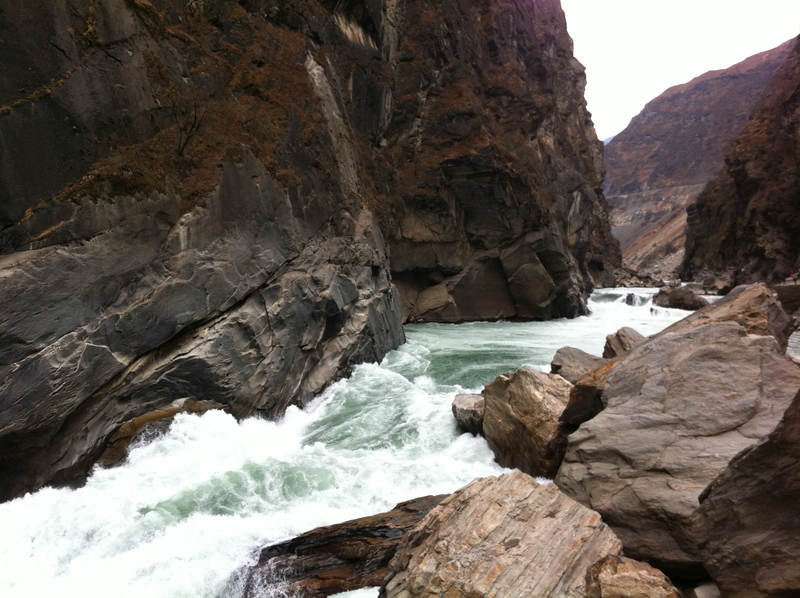 I forgot to mention that Tiger Leaping Gorge is one of the world’s deepest river canyons. We got to the trail head and hikers hiking up the pass said it took them about 2.5 hours (which is how much time we had till our bus was departing). Colleen, Jason, and I looked at each other and just started to book it down the gorge. We jogged for 20 minutes straight down the hill and found the boulder. We spent 10-15 minutes enjoying the moment and catching our breath and then walked briskly back up the very steep gorge (it was way worse than the 28 bends, but this time I kept some of my sanity). Where the tiger leaped the gorge and escaped its captors. We made it back with enough time to have a Coca Cola. We said goodbye to our Chinese friends and caught our bus to Sangri-La with Jason. We were fortunate enough to have 4 friendly Germans behind us on the bus (and you guessed it), we became fast friends. I’ll write a post about Sangri-La either later today or tomorrow. For now I must get out of Colleen’s apartment and move to my friend Erin’s apartment. -Molly We did it. Here is Colleen near the end of the hike with the Jinsha River behind her. 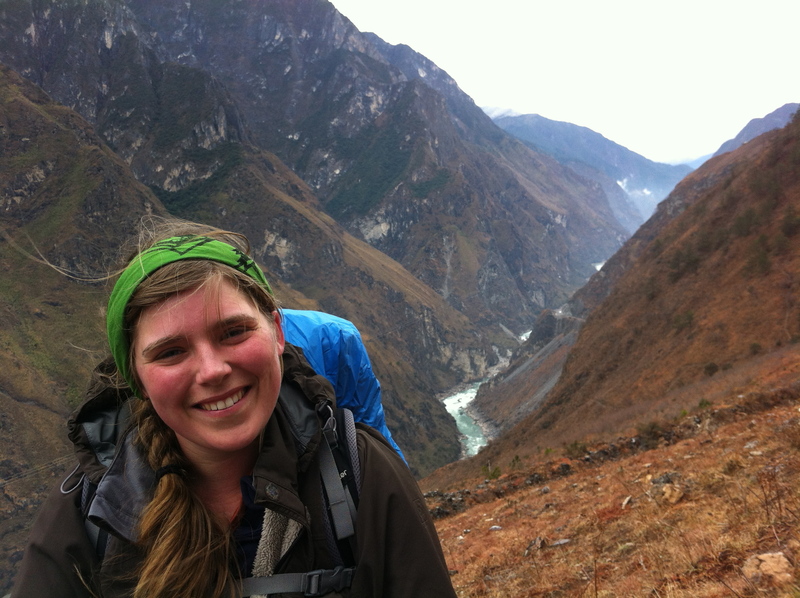 ← Tiger Leaping Gorge – A 2-3 day hiking trail found within the Himalayas. Oh m’ goodness, these are great Molly! And you’re in Tokyo now, what a freaking change a scenery!! I really like the pictures. Thanks Daniel! (I’ll actually be in Japan tomorrow, but whatevs!). I’ve made it a goal to find you in the South. I was going to visit my friend Sam to the West first, but I’ll be seeing him later on in Japan, so I’m going South to Kyoto, Hiroshima, etc. Hopefully going to do some WOOFING while going along. I’ll for sure contact you when I get close and I’ll have a Japanese phone by that time, so we can text/call and such. All you really need to know is “sumimasen” which means ‘excuse me’ and “arigato gozaimas” which means ‘thank you.’ Use them over and over again and it will summon a magical force field that will guide you safely through the entire land of Japan.